Hire A Pest Control Technician To Stay Pest Free! Irish legend says that each leaf of a four leaf clover stands for something: The first for hope, the second for faith, the third for love and the last for luck! St. Patrick’s Day is celebrated in different ways around the world. In some countries it is a serious observation, while some cities literally turn their rivers green to celebrate St. Patrick and his deeds. They say that everyone is Irish on this day, but it also serves as a reminder of just how small our world can be. Our e-newsletter provides us with a great opportunity to stay in touch with you, share tips and provide advice in the areas we feel are most important. Brezden Pest Control’s goal is to provide our customers with outstanding service and quality. If there is a topic you would like to see discussed in a future newsletter, feel free to let us know! Your feedback is always welcome! 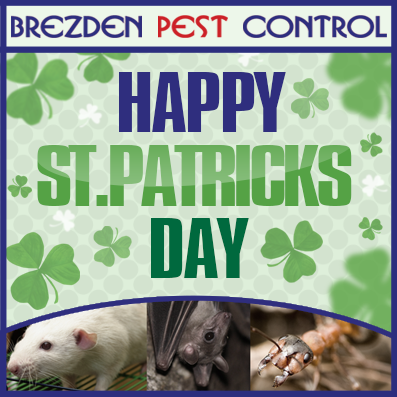 The professional office staff and pest control technicians at Brezden Pest Control would like to wish everyone a Happy St. Patrick’s Day. Summer is just around the corner, and it’s the time of year when the entire insect world seems intent on either stealing our blood or stinging us so we’ll leave them alone. Either way, they can make life miserable. Most of these pests inject a very effective local anesthetic so you don’t even feel it as they are stealing your blood. But the allergic reaction to the compounds they inject in you is what causes the eventual itching. And because they tap directly into your bloodstream, these pests are capable of transmitting various diseases when they bite us. Pests that inject venom when they bite or sting include honey bees, bumble bees, solitary bees, wasps, hornets, yellowjackets, fire ants, harvester ants, spiders, stinging caterpillars, scorpions, and certain centipedes. -Get rid of any piles of debris from your yard – this includes lumber, firewood, or even bricks. All provide great nesting places for pests, especially ants. -Watch your sprinkler system – redirect your sprinkler heads if necessary so they don’t spray on your house foundation. -Seal cracks in the house exterior. -Keep garden mulch low – less than 2 inches thick. Keep it away from your house foundation. -Put screens on foundation and attic vents. Last quarter, we invested time strategizing with our online marketing team, and building out a newer, more customer-focused website site at https://www.brezdenpest.com. The new site features a layout that is easier for customers to navigate and provides relevant information and educational resources about local pest control and the damage they can do to homes, businesses, and people. We want our customers to not only recognize us as the providers of the best pest control services in San Luis Obispo, but to look to us for educational information, and tips and pointers about these pests and how to deal with or prevent them. 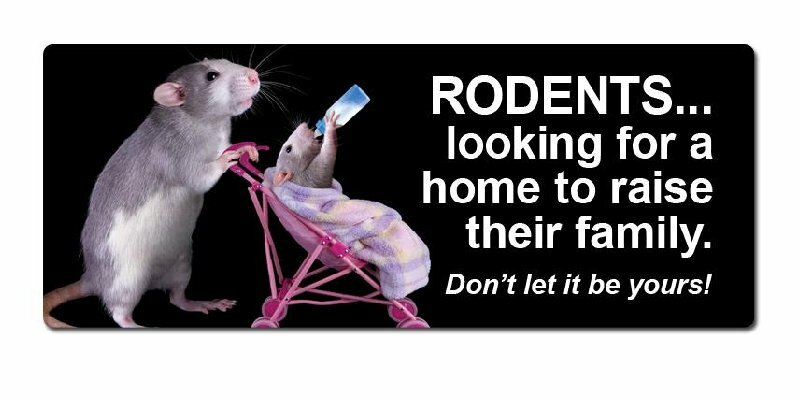 The new site features a blog that customers can follow to get valuable information about pests specific to the SLO County area, along with tips and guidelines on preventing infestations. A wealth of information is offered about the lifecycle, breeding and feeding habits, dangers and effects on humans, and control and treatment of each pest. At Brezden Pest Control, we know that it’s our loyal customers that keep us in business. That’s why we wanted to create something for them that not only shares information about our company, but also gives them the educational resources they need. The entire concept of the site is based on education and user-friendliness. We’re differentiating from our competitors by providing a valuable online resource that will be helpful to anybody with pest problems, questions or concerns. We hope you enjoy the newsletter and avoid those creepy crawlers. Be sure to LIKE us on Facebook for specials and helpful tips.